We all are aware of Bhakoot / Bhakut matching during marriage. 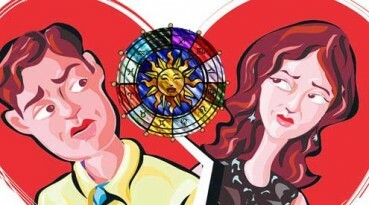 One of the things that astrologers focus on while horoscope matching is Bhakoot or Bhakut dosh. Bhakut has maximum 7 points and is a important factor to be considered during horoscope matching. Bhakut is very important when we are matching horoscopes through Ashtkoot Guna Milan. The 6-8 Bhakoot dosha is also known as Mrityu Shadashtak Dosha. This is when moon signs of Groom and bride are in a position of 6-8. It is known to bring death or death type of situation to the couple. Therefore cancellation of Bhakoot dosha is very important. if Moon Signs in the horoscopes of couple are making a inauspicious combination of 6-8, 9-5 or 12-2, Bhakut / Bhakoot Dosh is said to be formed. If Moon sign of the Boy is Aries and that of the Girl is Virgo or vice versa then Bhakoot Dosh of 6-8 is formed as the Moon of girl is sixth from Moon of boy and Moon of boy is eighth from Moon of girl. Likewise Bhakoot dosh is considered for 9-5 and 12-2 placements of Moon signs. The bhakoot Dosh of 6-8 can bring major health problem to the married partners and chances of separation are strong, Bhakoot dosh of 9-5 causes progeny problem and also bad relationship and bhakoot Dosh of 12-2 can bring health and financial problems after marriage. There may be loss of job, transfer, the husband and wife may live separately because of job or career related issues. If there are malefic aspects besides Bhakoot in the Horoscope, the native will separate surely through divorce, mutual separation or even death of one of the partners. So many people want to know how to remove Bhakoot dosha. It is very important that Bhakoot dosha gets cancelled, because unlike other dosha like Mangal dosha, which can destroy happy married life instantaneously, Bhakoot dosha destroys marriage gradually. However the pain and separation has been seen to be more in Bhakoot dosha leading to life become total hell and problematic. One thing to note is that when we are talking about Bhakoot Dosha exception, the dosha does not finish completely till the remedies are performed. What we mean by exceptions is that the malefic effect of the dosha will not be as immediate and as strong as it would had been once the under given conditions are met. If the Lord of Moon Signs is same of both horoscopes, Bhakoot dosh is said to be lessened. The 6-8 Bhakoot dosh is said to be lessened in case of Aries-Scorpio and Taurus-Libra and 12-2 Bhakoot dosh is said to be lessened in case of Capricorn-Aquarius. Bhakoot dosha is less in this case but does not get completely cancelled. The actual Malefic effect caused by Bhakoot Dosh gives different results to each couple depending upon the planetary aspects present in both the horoscopes. These defects can be potentially more serious if some other Dosha like Nadi Dosha, Gana Dosha and the weak Graha milan is there in the horoscope. If you have Bhakoot Dosha in your Horoscope Matching, get a detailed Guna and Grah Milan analysis to know details of your horoscope matching. Look forward to help you with this Divine Knowledge. Hi sir. Can you please tell me is our marriage preferable? Hello sir,, sir i want to ask that if nadi gun scores 8 points(full) ,, will it cancel bhakoot dosha ,,,?? Bhakoot dosha is totally different from Nadi dosha. Bhakoot dosha has different rules for cancellation. Sir please check if bhakoot dosha gets cancelled? Checking for Bhakoot Dosha cancellation is time consuming as it requires analysis of both horoscopes in detail. Therefore it is suggested that you look for paid analysis for a complete Horoscope matching.